The spectacular 18-hole layout at Puerto Los Cabos could be said to have something of a split personality at the moment as the current hybrid configuration consists of a 9-hole circuit designed by Jack Nicklaus and a 9-hole loop from Greg Norman. The long term plan is to double the Golden Bear’s nine holes, creating a public course called The Marina, and extend the holes on the Great White Shark’s existing track to form an 18-hole course named The Mission. For now, the contrasting styles of the two nines present golfers with a game of two halves – literally – and they offer a sneak preview of what’s to come in the fullness of time when Grupo Questro, the developers, complete the golfing element of the Puerto Los Cabos estate. The Norman front nine is characterised by deep and steep greenside bunkers – those positioned above and below the green at the par four 5th are particularly eye catching – whilst the Nicklaus back nine has more of a desert course feel with island tees forcing golfers to carry tee shots across native vegetation at many of the holes. Both courses occupy hilly terrain that lends itself to some serious changes of elevation – none more so than at Norman’s 213-yard 6th, the signature hole on the card, where a lofty teebox is perched more than 200 feet above the fairway. The best of the Nicklaus holes is the par five 14th, where an arroyo crosses the fairway as it winds its way to an oceanside green that’s positioned between a couple of small sand dunes. Two years and a half after my first visit I was able to go back to Puerto Los Cabos. In December 2014 the course had suffered Hurricane Odille and the small Proshop was devastated, but the course was in very good shape. Now in my second visit the other 9 holes to complete the Nicklaus Course are almost ready and the Club House will be inaugurated in October 2017. We played in a fantastic 25C sunny day and one of the stars were the comfort stations where you can eat and drink all you want. Course is fantastic, the combination of the Shark and the Bear is smoth and nice. In the front 9 (Shark) holes 6-7 are the best, nicest and with breathtaking views. Then the back 9 at 14-15 you have the contact with the Ocean and in 18 a fantastic finishing hole. It is a course where combining the sets of tee you can modifiy the hole and really have fun or test your game to the very limit. It is a very nice starter for a 7 days and 6 rounds Tour to be combined with Palmilla, Cabo Real, Quivira and Cabo del Sol Ocean and Desert. After a long combination of flights 2 days before and playing Club Campestre San José just after landing, the round at Puerto Los Cabos was the first “official” round of golf of the 2014 Fam Trip. 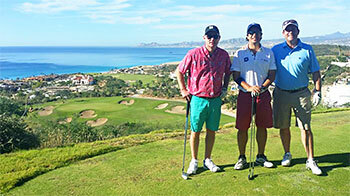 Although we were playing a fun tournament of 4 rounds, the most important part of the trip was to experience the course in order to be able to tell potential customers what they can expect of a trip to Unstoppable Los Cabos. And it is a great beginning to play a course which has 9 holes by Greg Norman and another 9 by Jack Nicklaus. In the future they expect to have all 18 from each designer, but I really loved the experience of playing a course designed by my 2 youth heroes. I need to add that the transition from one half to the other is so smooth that if you are very focused on the game you do not feel that you have changed the designer in the middle of the layout. The front 9 (Norman) start with an uphill short par 4 where second shot is tough to hold the ball. Second and third (par 3 & 4) are downhill and you get the first nice views of the sea. Four has nothing special but fifth is a strong dog leg to the right short par 4 with a blind tee shot where long hitters will get home with the driver. And then 6-7 are two of the most spectacular holes on the property: 6th is a downhill 200yds par 3 with fabulous views of the Sea and Cabo San José while 7 is a downhill par 5 towards the Ocean although it is not by the shore. The last 2 holes on the front 9 are 2 uphill par 4s where tee shot is very demanding, specially 8th. Back 9 start start with a very uphill 3 shot par 5, which is a typical hole you see in Sotogrande. 11th is a short and tricky par 3 with a huge green (I made a 50 footer for birdie) and 12th is a long downhill par 5 only reachable for very long ones. 13th is a nice short par 4 with a tough approach shot and 14th in my opinion is the best hole on the course: a mid par 5 dog leg to the right with serious damage on the right for the tee shot, while second shot is to a green that ends on the beach, really breathtaking! If you lay up, then the view of that 80yds wedge is maybe the best on the course. 15th by the Ocean is a very nice short par 3, then 16-17-18 are 3 very strategic par 4s, where tee shot at 18th is maybe the most demanding shot on the course. One in all, it is a course I would always play: well maintained, greens rolling pretty fast, variety in design, the Comfort Stations every 4 holes give you the chance of some tequila, tacos, bloody Mary and a lot more. The course suffered with Hurricane Odile on 15.09.2014 and 2 months later it was almost perfect, where only Club House needed some more time to complete the restoring. A very well operated course which will be always a pleasure to play. If you are not used to play paspalum grass, remember it is sticky and you need to be very sharp with the short game! Los Cabos Mexico lies at the tip of the Baja California Sur Peninsula also affectionately known as Land’s End. It’s here where the mountains and desert merge with two seas. The Puerto Los Cabos Golf Club is unique in that it features two distinctive nine-hole layouts by two iconic golfers. The Mission Course was designed by Greg Norman and opened in 2007. It offers plenty of elevation changes with wide fairways and large fast greens. The 6th, an intimidating downhill par 3 that drops some 105 feet features the Sea of Cortez as your backdrop may be his signature hole but the next hole is my personal favorite. This visually stunning par 5 sweeps downhill like an alpine ski run then finishes with to a well-protected green perched on the edge of the expansive two mile sand beach. The Marina Course is a Jack Nicklaus design that opened a year later featuring wide rolling fairways that resemble ski mogels with very few level lies. #15 is considered his signature hole, a par 3 that runs parallel to the beach. The 18th is a great finishing hole where the irrigation reservoir comes into play on both your tee and approach shot. The greens here are deceptive. They break more than you think and almost always to the ocean. Both courses have Paspalum greens and fairways and offer magnificent views of the ocean and the Sierra de la Laguna Mountains. The biggest difference between the two, besides the moguls, is that Norman has built larger, more traditional tees with grass between each block whereas Nicklaus has smaller tee areas surrounded entirely by sand. Click to read Dave’s complete story on Golf in Los Cabos Mexico on his Golf Travel and Leisure website.